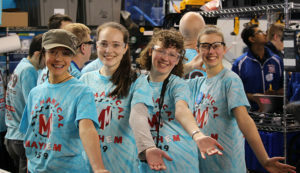 On April 5-8 at the University of New Hampshire in Durham, NH, Mechanical Mayhem excitedly competed in the New England District Championship with our robot, Blaise’n 40. 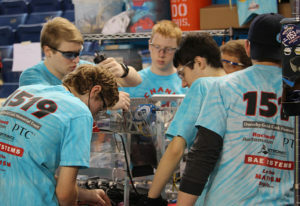 Although the first day had a rather rough beginning, Mechanical Mayhem gathered itself up and began to steam ahead, achieving the qualification ranking of 15th on the second day of matches. However, Blaise’n 40’s and Mayhem’s success did not end there. 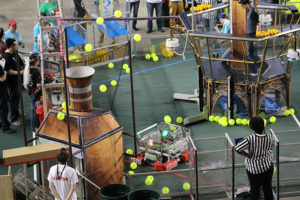 The alliance selection was a very exciting event for all of the teams. 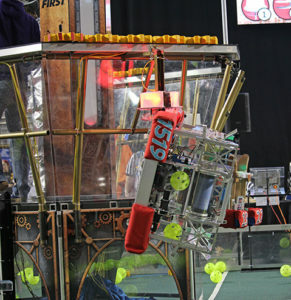 The third ranked team 3719, the STEM Whalers, invited Mechanical Mayhem to join their alliance, and thanks to the detailed data provided by our steadfast scouts who analyzed every robot throughout the 128 matches, the third seeded alliance selected team 5813, Morpheus, who graciously accepted. Although our alliance initially faced a challenging quarter-final match against the sixth ranked alliance and lost the first match, our alliance battled back in two very intense matches to proceed to the semi-finals. Although the semifinal scores were very close and our alliance again lost the first match, we then won two consecutive times, moving us up into the finals matches. Even though we tried our hardest, we were defeated by the first ranked alliance — congratulations to teams 2168, the Aluminum Falcons; 195, the CyberKnights; and 1073, The Force Team! You earned it! Mechanical Mayhem, the STEM Whalers, and Morpheus did not let this defeat bring them down, but held their heads up high as they walked down the stairs to the floor of the arena to graciously receive their Championship Finalists Awards. We were all proud of what we accomplished together as an alliance and of what our respective robots achieved. It was a pleasure to work with 3719 and 5813. At the completion of the New England Championship, the New England teams were ranked based on points accumulated at their district events and the championship. Mechanical Mayhem ranked 3rd of 194 in New England!